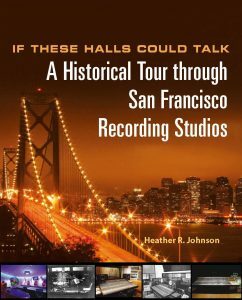 If These Halls Could Talk: A Historical Tour Through San Francisco Recording Studios, originally published in 2006 by Thompson Course Technology, is back in print. It’s available now for $29.95 via The Book Patch at bit.ly/ifthesehalls. Know someone interested in record production, audio engineering or the stories behind the music? They’ll enjoy this. And your purchase will go to a good cause. I’m donating 20% of the book sales to Women’s Audio Mission, a San Francisco-Oakland-based nonprofit dedicated to getting more women and girls into STEM and creative technology studies. One of the only (and arguably the most comprehensive) sources of historical information on Bay Area recording studios, If These Halls Could Talk had been out of print for a few years. I recently obtained all rights from Cengage, which acquired Thompson, and republished the book. I’m officially a self-publisher! About the book: Through the eyes and ears of leading Bay Area artists, producers, engineers, and studio owners, If These Halls Could Talk: A Historical Tour Through San Francisco Recording Studios takes readers on a guided tour through some of San Francisco’s top recording studios, venturing behind the scenes of some of popular music’s hottest albums. Readers will learn about the recording techniques, the magic and the often unusual experiences that transpired within the Bay Area’s soundproofed walls. Artists featured include Jefferson Airplane, the Grateful Dead, Santana, the Pointer Sisters, Herbie Hancock, Journey, Huey Lewis and the News, Chris Isaak, Faith No More, Green Day, and many more. In addition, If These Halls Could Talk chronicles the arrival, expansion and departure of recording studios in and around San Francisco. Recording engineers will appreciate discussion of the advancements in technology through the years and its effect on the recording industry. Readers will also learn how the San Francisco Bay Area’s recording facilities endured (or tried to) through economic ups and downs, increased competition, decreased demand and the ever-changing, unpredictable music industry. Readers: Follow “If These Halls” on Facebook at facebook.com/ifthesehallscouldtalksf. Sign up for the mailing list here. More info: To read an excerpt, including the forward from NAMM TEC Hall of Fame inductee Leslie Ann Jones, please visit heatherraejohnson.com/books. About the author: Heather R. Johnson interviewed hundreds of recording artists, producers and engineers as a leading professional audio journalist from 1999 to 2009. During that time, she wrote for Mix, Electronic Musician, EQ, Audio Mediaand Performing Songwriter, among others. Thompson Course Technology (Course PTR) publishedIf These Halls Could Talkin 2006. In the years to follow, she watched some of the San Francisco Bay Area’s preeminent recording studios convert to condominiums and Airbnbs. In an effort to keep her home’s history from getting lost in the rubble, she obtained the rights and republished this book on her own. She now lives and works as a content marketing writer and copywriter in Oakland, California.